I woke to another morning of blue skies and sunshine, which was a surprise as the forecast had suggested that it would be overcast today. However I didn't complain! The campsite warden kindly let me charge my backup battery pack in reception whilst I enjoyed a breakfast of crunchy nut cornflakes and started to get myself ready. I set off walking just after 10am this morning and followed the B863 road east along the south shore of Loch Leven. I passed another challenger who was resting in the shade at the bottom of the track over the shoulder from Glencoe. I realised that since arriving back on the mainland on Friday afternoon I had yet to dip my feet in the sea! Therefore I took the opportunity to nip down to the seaweedy shore of Loch Leven to get my boots wet before leaving the west coast. After a bit more road walking I reached Kinlochleven, where I popped into the Coop to resupply with food, before heading into the Ice Factor cafe for a late lunch of burger and chips (again!). Here I met David from Devon who was on his 3rd crossing, but the first for several years. He'd started from Acharacle and was the first challenger I'd met on my crossing who hadn't started at Oban! After much chatting I thought I'd better actually make some more progress eastwards, so I set off up the West Highland Way sometime after 2:30pm. This section of path was very, very busy and I reckoned I must have passed at least 50 other walkers descending to Kinlochleven whilst I headed the other way. 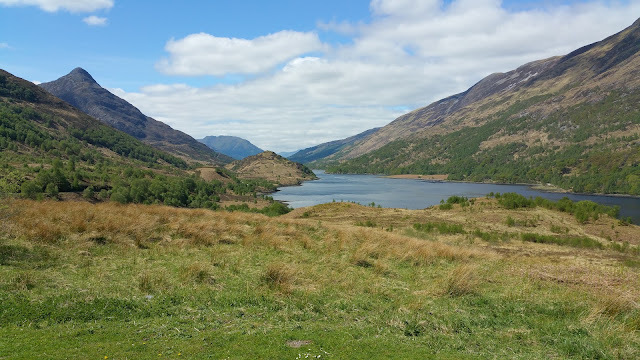 Eventually I left the West Highland Way and continued on the vehicle track towards the Blackwater Reservoir; I saw no one else for the rest of the day! At around 6pm I reached the end of the track at the Blackwater Reservoir dam. I considered trying to camp somewhere alongside the reservoir and then picking up a new track 3km east of the dam in the morning, which I had noticed on satellite images shortly before the challenge. However as the weather was nice, I decided to continue with my planned high camp as I might not have another opportunity this challenge if the weather deteriorates. Therefore I headed up into Coire Garbh, visiting several of the burns before deciding to follow the largest one upstream. After a while I stopped to collect water from the burn whilst there was still sufficient flow. My bag was now much heavier as I picked up water for tomorrow to so I could avoid descending in the morning. I soon found somewhere mostly free of heather to pitch my tent and set about cooking whilst enjoying the view from my tent. It had been another good day of walking! After a cold frosty night, I woke to warm sunshine on the tent. I was in no great hurry to start walking this morning after yesterday's late finish, and I also believed that today would be shorter too! Therefore I spent a leisurely time in the sunshine warming up after the cold night, but finally setting off walking at around quarter to eleven! It was a tough, steep climb up the southern slopes of Fraochaidh in the warm sunshine. 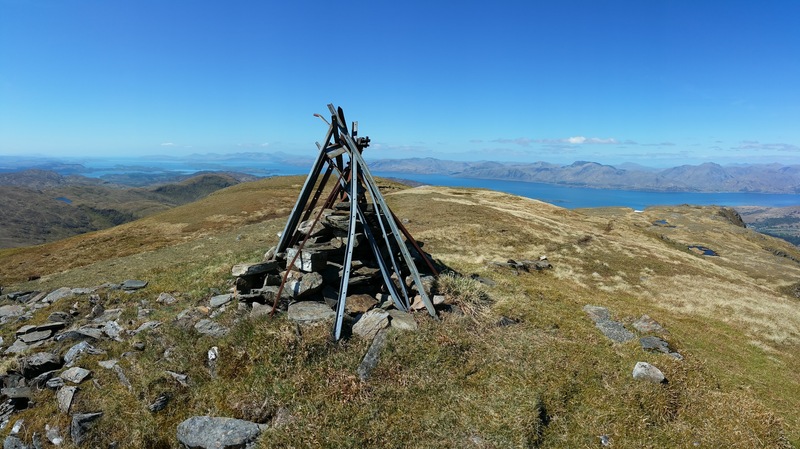 However eventually I reached the summit, and I was rewarded with fantastic panoramic views of the many peaks of Lochaber and across over to Loch Linnhe to Ardgour and Mull, plus I could just about make out the Paps of Jura in the distance to the SSW. The first photo below is a panorama of Beinn a' Bheithir and the Glen Coe hills from the summit of Fraochaidh. The second is the summit cairn with Loch Linnhe, Mull, Lismore and Ardgour beyond. 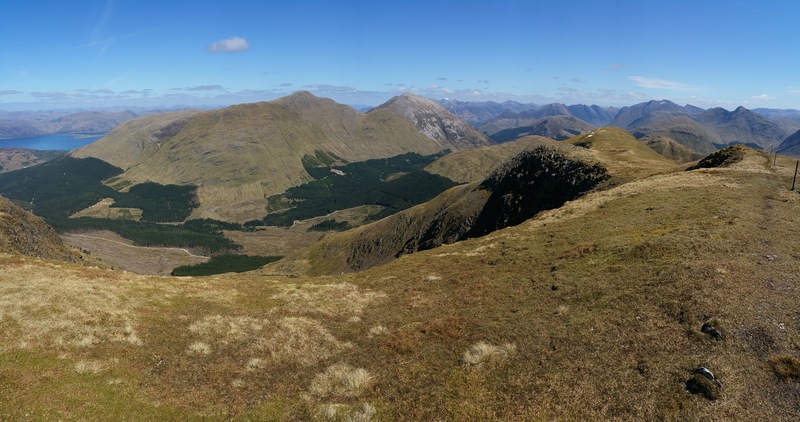 After spending a fair while taking in the views, I started my descent down the east ridge over several subsidiary tops to reach the Mam Uchdaidh, where the right of way from Glen Creran crosses the hills on its way to Ballachulish. I toyed with the idea of descending this way myself, but decided to stick with my plans to climb two more hills this afternoon. The ascent up to Sgorr a' Choise was very heathery to start with, but there seemed to be some faint paths to follow that made the going slightly easier. Higher up the ground became rockier and I eventually managed to lug my heavy pack up to the summit of this hill. Again the views were stunning :-). Continuing onwards in the hot afternoon sunshine I slowly climbed up my final hill of the day: Meall Mor. Despite the south ridge not looking horrendously steep, I found it hard going and wondered whether I should have descended after Fraochaidh. However by now the easiest route to Glencoe lay over the top of Meall Mor so I continued with my ascent. I reached the summit of Meall Mor just before 6pm, with yet more great views! Just east of the summit there was a great vantage point for looking up the length of Glen Coe surrounded by the Aonach Eagach and Bidean nam Bian hills, as shown in the third photo. 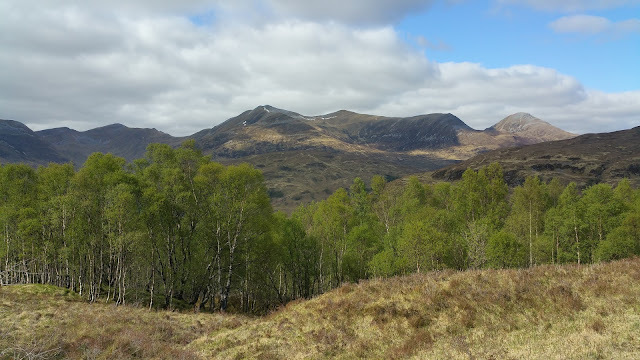 I was now quite tired and had concluded that I would miss out my first hill tomorrow, Garbh Bheinn, and instead head via Kinlochleven. This therefore meant that I could resupply there instead of Ballachulish as planned. Therefore I headed towards Am Meall as planned, but instead of continuing up this small hill from the bealach I instead picked up a newish forest road heading down into Glen Coe. This seemed to go on forever as it looped endlessly down the hillside. I was keen to get down as I'd finished the last of my water and was feeling thirsty again! Eventually I reached the bottom of the glen where I picked up a pleasant woodland path running parallel with the A82 towards Glencoe village. Shortly after 8pm I reached the Glencoe Gathering pub and headed inside for water, real ale, burger, chips and ice cream! 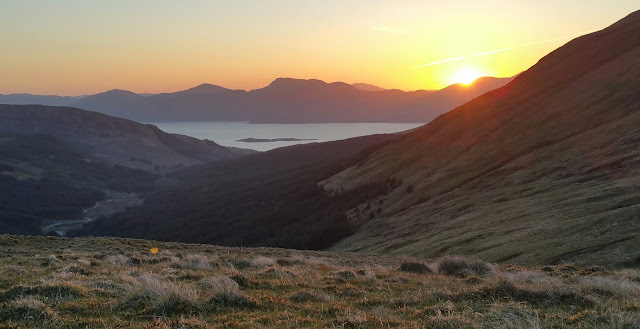 I then headed to the Invercoe campsite where I pitched my tent at sunset after a cracking day in the hills, although I perhaps wished I'd set off earlier this morning! I left the SYHA on a sunny morning, after signing out at around 8:30am and nipped down the steps opposite to dip my feet in the sea. A quick walk around the harbour brought me to the Lismore ferry, with 7 other challengers already on board. After a breezy crossing of the Lynn of Lorn, we arrived on Lismore shortly before 10am. I walked up the track to Balure with Janet, with four other challengers a few hundred metres ahead of us. The first photo below is on the coastal section of the track. I'd heard that the second half of this track could be tricky to follow, but we had no trouble today (although it wasn't always where it was shown on the map!). A road walk then led us to the very windy, and overcast, NE tip of Lismore, we the eight of us gathered in the ferry waiting room out of the wind. A short ferry journey then took us back to the mainland at Port Appin, where two of us opted for pub lunch. The fish and chips were very tasty :-). Soon I was on my own following the road to the Jubilee Bridge and then ESE along the cycle path for a few kilometres. It was nice to be off the road, but the path was still tarmac so I was glad when I left it to head up Gleann na h-Iola! It was good to finally get up into the hills, with excellent views back over the seascape to the SW. The track made for easy walking, except where I had to divert to avoid a large heard of very inquisitive cows! A long climb out of the head of the glen then followed, with the sun starting to break back through the clouds. 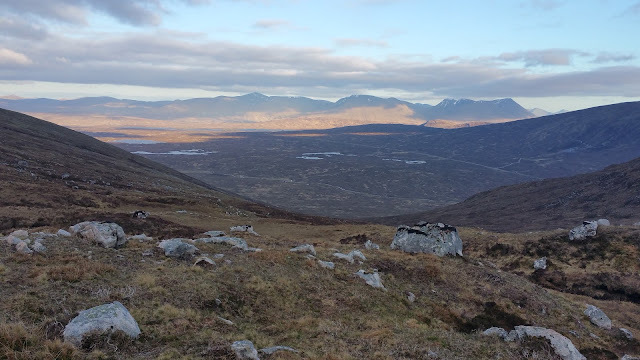 My ascent was steeper than planned due to an unexpected deer fence around newly planted woodland, but eventually I was able to contour up to the ~500m bealach as planned. The views were stunning with a now near cloudless sky! 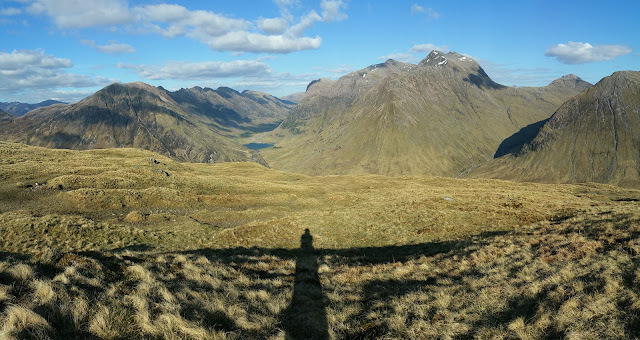 Continuing on to Beinn Mhic na Ceisich the views just got even better, with a great view of the Glen Coe hills from the summit (see photo below). It had been an excellent start to the challenge, although quite long at 29.5km! However tomorrow would be shorter, but with more hills. Having previously started at Shiel Bridge, Strathcarron, Mallaig and Glenelg, I decided I fancied a more southerly route this year, so I've opted to start in Oban. However I also wanted to visit Ballater and finish in Stonehaven, which are both more northerly than any of my previous routes! Therefore my resultant route is reasonably southerly, before heading NE from Pitlochry to Ballater. It's a similar length to my previous TGO Challenge routes, at 325km, and there's around 14,000m of ascent. Assuming that the weather is fine I'm planning on climbing 7 Munros, 7 Corbetts and 3 Grahams, plus a few other hills on the way across. However I anticipate that bad weather might put pay to some of these plans! Although you never know, it might be another year like 2008 when it was dry and sunny for most of the fortnight!